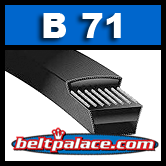 B71 Power King (HI POWER II) V-BELTS: B Section. 74" (1880mm) Length, 21/32" (17mm) Wide. Oil, Heat and Static resistance meets or exceeds RMA Standards. Suitable for all industrial applications, including v-flat drives. 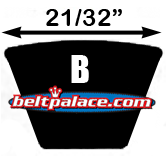 BX71 BANDO Molded Notch V-Belts, BX Series. 21/32" (5/8") x 74" L OC.